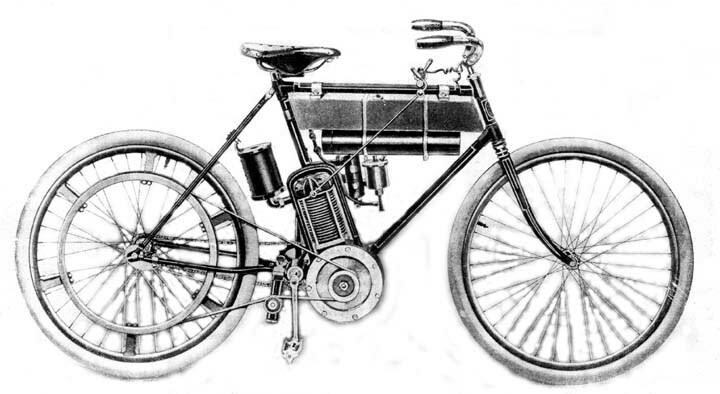 Photo Credit: "Historical Bradford Illustrated 1901"
The Holley Motor Cycle, or to use a more comprehensive term, the Autobike, is a machine of unique construction, the result of five years of careful study and experiment and the first of the kind for practical every day use that has yet been built. This machine combines the conveniences of a common cycle with the power and speed of the automobile, in fact a combination of the best of both without the annoyances of either. To quote from the circular the manufacturers have deviated from the common custom of bolting a motor to some part of an ordinary bicycle and instead have made it an integral part of the frame by brazing it at the crank bracket the lowest and strongest part of the bicycle. By this means the motor will generate its full power and the scientific distribution of weight doing away with the vibration, adding to the durability of the machine and increasing the speed and easy running qualities. The standard model motor of 2 1/4 horse power, will propel the machine at the rate of thirty-five miles per hour over an ordinary country road and will ascend a 20 percent grade without the pedals. The gasoline tank has a capacity of one gallon, which is sufficient to run the motor fifty miles. The frames are either 22 or 24-inch and the wheels 28 inch and all the equipments are made especially for this machine. The motor cycle is manufactured in Bradford by the Holley Motor Company, which has factory on Davis street. The business was started in September 1899 and has now passed the experimental stage. The factory is equipped with the best machinery and has a capacity of five cycles per day. The general manager of the company is George M. Holley. He was born at Port Jervis, N.Y. in 1878, and his life since leaving school has been devoted to work of this character. The present machine which he builds is the result of his research and experiment. George M. Holley and his motorcycle did some rapid traveling. George M. Holley, inventor of the motorcycle which bears his name, returned last night from Buffalo, where he has been exhibiting his machine at the International Bicycle races in the Pan-American Stadium. He rode a five-mile exhibition against the record by the Champion, and succeeded in breaking all exsisting records from one to five miles. The Express of yesterday contained the following in reference to the event: "Another feature of the day was the performance of G. M. Holley on his single motor. Holley was tearing about the track after the five-mile record when he lost control of his whirling engine close at the finish and went bounding off the board platter. The only damage was to stir up the officials. Holley never lost presence of mind nor attempted to dismount, but shut off the power and continued the trip over the sod. After a rest Holley came on again adn this time was succcessful in lowering all exsisting marks for five miles. "Event No. 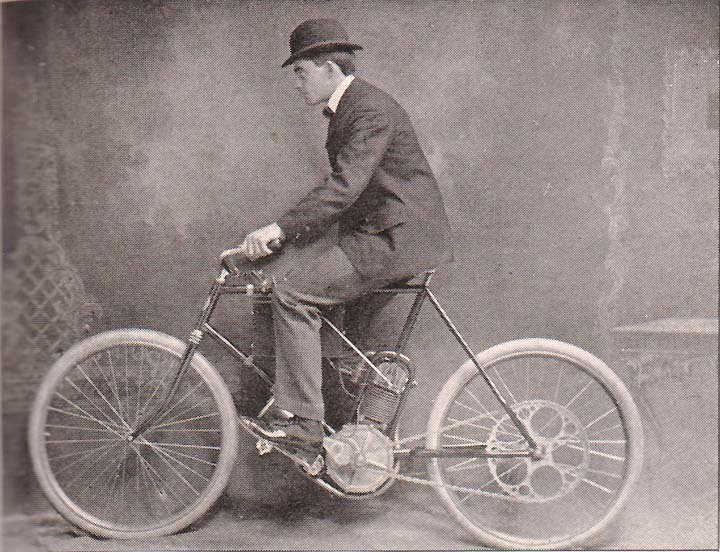 4- Exhibition of five miles, on single motor bicycle, by G. M. Holley. Time by miles: First, 1:24; second 2:50 2-5; third, 4:16 3-5; fourth, 5:44. Going into the fifth mile Holley ran off the track. Holley broke all records up to four miles. Previous motorbicycles records: One mile, 1:26 2-5, by Champian at Charles River Park, Cambridge, Mass., on July 31, 1901. Five miles, 7:16 2-5, also made by Champion. "On Holley's second trial he rode five miles as follows: First, 1:23 1-5; second, 2:47; third, 4:11 3-5; fourth, 5:38; fifth, 7:10 1-5, All world's records." Mr. Holley will return to Buffalo tomorrow and on the following day will compete in the motorcycle races at the Stadium. A special race has been arranged between Holley and George Butler of Buffalo, on single motor machines. He was the winner of the Motor Race from Boston to New York. New York, July 6.-Thirteen of the 33 motor cyclists who started from Boston for New York at 8 o'clock Friday morning, in the inaugural American endurance run promoted by the Metropole Cycling Club, of this city, arrived at the finish, at 60th Street and Broadway, before 10 o'clock last night. The four leaders arrived in New York far ahead of their schedule and remained in Central Park until the schedule allowed them to come in and be scored. The following are those who finished and the time of their arrival: G. M. Holley of Bradford, Pa., on motor invented and made by himself, 5:18; M. P. Bernard, Crescent, 5:18; O.L. Pickard, 5:18; L. M. Roberts, 5:18; W. B. Jameson, 5:31; G. W. Sherman, 5:38; G. M. Hendee, 5:41; E. Hefilfinger, 6:12; F. W. Tuttle, 6:12; W. T. Marsh, 6:33; Joe Downey, 8:38; O. Mankowski, 9:00; Henry Almen, 9:05. Boston-New York Endurance Contest the Biggest Event in Years and Proved an Eye Opener- Awakened Great Interest in Motor Bicycles- The Men who Competed and how They Fared. It may now be said that the public and the motor bicycle are fairly acquainted one with the other. While they have known each other in casual fashion for some little time, the formal introduction did not take place until the 4th and 5th of the current month. The Metropole Cycling Club, of this city, played the part of introducer, and played it well. Its Boston-New York endurance run on those dates was the occasion of the introduction, and the trail of interest and publicity which the event created, and which radiated in every direction through the public prints, in ample evidence that the hopes of the promoters were more than justified. The contest demonstrated thoroughly the practicability and reliability of the little self-propeller on give and take roads, under conditions both favorable and unfavorable, and as fully proved that the man is no less a factor than his machine. Skill and expertise counted for much. It was a test full of accident, incident, instruction, and color. Of 32 entries, 31 started from Copley Square, Boston, on the morning of the 4th. The solitary non-starter was on the ground the night before, but for cause was then and there summarily discharged and his bicycle taken from him by his employer, who also was in evidence. Frank Kellogg, of the Massachusetts Bicycle Club, was the starter who sent the men away in pairs at intervals of one minute. C.A. Persons was the first man to be given the word, at 8 o’clock sharp. H. J. Wherett, the last one, did not leave until 8:59, forty-three minutes behind his scheduled time of departure, and long after the crowd of spectators had frittered away. Of these spectators the most notable was Frank W. Weston, the “father of American cycling,” who twenty-five years before had introduced the then bicycle to the public and gave it the life, purpose, and prominence that led ultimately to universal popularity and, in the natural process of evolution, to the motor bicycle. As lined up the contestants made a picturesque gathering. There were tall men and short men, thin men and men not so thin, and one who cam close to being fat, Jameson, of Waltham, short, stout and with a round, good natured face. It was their diversity of garb, however, that formed the picture. There were the Marshes in leather coats, caps and leggings; Seaman in a suit of blue “jumpers”; Beeber and Rogers in military khaki; Holley wearing street clothes, a cap and starched shirt and collar; Persons and Roberts in Norfolk blouses; others wearing ordinary bicycle costumes and caps, and one tall youngster, Burnham, of Waltham, attired as if for a ride around the block, street clothes, starched collar, flat brimmed straw hat and all; he even did not secure his long trousers with trouser clips. This same Burnham was the character of the run. His conduct was as odd as his clothes. He apparently knew no one, and sought to make no acquaintances; he rarely spoke. But the boy knew how to handle a motor bicycle. ON the first day he scored his 500 points with plenty of time to spare. He reached Hartford early, and as fresh as if he had ridden 26 miles instead of 126, quietly deposited his machine in the control, and then disappeared and was seen by none until the next morning. His performance, coupled with his oddity of dress and action, was noised about, and overnight he became the wonder of the run. The Marsh contingent were in ecstasies, and were in a mood to “do the handsome” for the unknown. He was not seen again until the next morning, a few minutes before the start. He reached Meriden, still with a perfect score to his credit, and there the “wonder” of two hours before developed a deep streak of chromatic yellow. He quit suddenly and without cause. His machine was working splendidly, and he himself said he was not tired, but no amount of persuasion could induce him to go a yard further. When his quitting became known to the admiration of the day before quickly changed to curses of condemnation. Most of the other contestants were made of sterner and less eccentric stuff. They pressed on until physical or mechanical troubles forced them to stop. Seaman, of Mineola, L.I., Broke off his right crank and a portion of his crank shaft in starting, but nevertheless covered the 81 miles before quitting. It was tire and coaster-brake troubles that caused most of the early retirements, Root and Wherett, on Strattons, being the first and chief sufferers from motor troubles. The former attempted to drive his motor with a long chain direct from a rear sprocket to the gear wheel, and did not get five miles outside of Boston. Wherett’s motor also went wrong soon after the start. It rained the night of the 3rd, and in consequence the usually fine roads out of Boston were in treacherous shape. But, despite their slipperiness, the men took chances, most of them riding as if fast time, instead of a steady 15 miles per hour, was the object. As a result the laughable spectacle was presented at the first control, South Framingham (23 miles), of 28 of the contestants grouped within a few yards of the green flag denoting the control. They refused to actually pass the flag until their 15- mile time limits expired. This procedure ensued with decreasing numbers at practically all of the succeeding controls. Even before the contest started there were stories that the two men from the West, Beeber and Rogers, were subjects of solicitude on the part of not a few of the others. Beeber and Rogers came direct from the Mitchell factory, the last mentioned having only recently come from abroad, where he had earned a reputation by piling up not a few motor bicycle records. They had ridden over the course the reverse way, going form New York to Boston, and the experts from the other factories seemed to view them as objects of particular interest and for particular attention. It soon became known that the two Westerners, with Roberts and Jameson, the Orient pair; Pickard and Sherman , of the Indian tribe, and George Holley, were each concerned about the other. The four Hartford men were also factory experts but were under the direction of a manager, and they had little to say for themselves, but heir eyes were supposed to be open. The result was that one or the other was always in front. Usually they were in pears, each shadowing a particular one of the others and making sure that he did not keep more than a few yards away. Some fast work, which ended only when the green flags came into view, was the outcome. The men were experts in every sense of the word. The way they handled their machines was a revelation. They took all sorts of chances on all sorts of roads, and when all was over even Pickard, on the most daring, was full of praise for Holley and Bernard particularly. Unfortunately for all, Beeber and Rogers were among the first to reach trouble. Rogers was bowled out by a big stone beyond South Framingham, which crushed his front wheel and threw him hard. He sustained a cut to the bone on one arm, and could not continue. Press dispatches afterward stated that he had been carried to a hospital, but these were untrue. He came by train to New York, arriving in time to see some of the survivors finish. Beeber came to grief soon after his mate. His tire punctured and coaster-brake went wrong, and after he had repaired things news of Roger’s accident reached him in exaggerated form, and he spent some time in trying to locate him. Being unsuccessful in his quest, he went on, reaching Springfield after the control had closed. He remained there overnight, and early the next morning made an effort to reach Hartford on his bicycle, but rain during the night had converted the road into a quagmire, and the quagmire won. The other Mitchell entries, Mankowski and Alimen, gave rare exhibitions of pluck and road endurance. The former, an individual entry, had been riding a motor bicycle but ten days. He had trouble on the slippery roads out of Boston, but reached Warren but 25 minutes late. After that he had several bad falls, and reached Springfield hours behind his schedule. Nothing daunted, h e pushed on in the dark, arriving at Hartford minutes after midnight, having walked some of the 26 miles from Springfield. The next morning he was groggy, but still game. He again ran into trouble after leaving Hartford, and had more tumbles. He bent his spokes several times, and finally arrived in New York at 9 o’clock, with his muffler tied on, his mixer loose and rattling, and his frame out of true. Alimen’s experience was much the same, save that a puncture added to his woe. He reached Hartford after dark with one trouser leg rent from top to bottom, and came into New York five minutes after Mankowski. Falls which bent his cranks and ripped a dozen spokes out of one wheel, and a heavy rain squall had caused much of his delay. Of the Indian triumvirate Hendee, probably the heaviest man in the run, was the chief sufferer. He sustained four falls, two of them bad ones. On the first day he ran suddenly into a gulley after crossing a railroad track, and was thrown heavily, cutting his face and tearing his rousers. At Bridgeport the next day he continued and a ajdist and was almost put out of the running. Despite his accidents, however, he reached all controls witin his time limits and scored the coveted 1,000 points. Fortune and foresight favored the Indians. They were the only men to carry an extra supply of gasoline. It was carried in canteens slung across their backs. Once when Hendee fell he ripped his gasoline tank and spilled the fluid, and, as luck would have it, at the very moment an itinerant tinker drove up, soldered the hole in the tank, and with his canteen of gasoline at hand Hendee lost little or not time. On another occasion Sherman fell and broke a crank, and again fortune smiled through the cloud; the accident happened directly in front of a repair shop. The Orient men met with little in the form of either accident or incident. Jameson suffered some slight belt trouble; that was all. The Marsh contingent had a succession of hard luck. Nearly all of the machines were new ones that had not been ridden until the day preceding the race. (indecipherable line) device with which the makers are experimenting. The men did not arrive in Boston until late the previous night, and at least two of them started in the contest the next morning without having had breakfast. These two A.R. Marsh and Robert Halshall, were taken sick at Worcester and forced to quit. Of the others Jenkins, Brown, Hoyt, and G. L. Marsh were put out of the running by the breakage of their coaster-brakes, Hoyt breaking a second one after having it substituted for the damaged one at Worcester. Lane ran into a telegraph pole on the second day, and was placed hors de combat. W. T. Marsh came through after a petty trouble near Worcester that delayed him just long enough to keep him out of the gold medal awards. Joe Downey, the other Marsh survivor, had a deal of worry and lost many valuable minutes the first day by thoughtlessness. He carried an extra tank of gasoline and foolishly fed the fluid through a length of rubber hose. The gasolene, of course, ate the rubber, and in due time Downey’s gasoline supply was choked, and he had no easy time clearing the tank. He rode into Hartford disgusted and swearing at himself. The American Cycle Mtg. Co.’s quartet, the four Hartford entries, were a competent lot. They knew their machines like a book, and knew how to handle them. Bernard was easily the “star.” Save for one puncture and the breakage of a chain link, due to his use of one that was a size larger than the others, he went through without a skip, fall, or mishap, and was one of the freshest men at the finish. O’Malley had a puncture between Springfield and Hartford which let his wheel down on a stone and tore off his muffler. The puncture was a bad one and could not be repaired. O’Malley filled the tire with sand and made a game effort to reach Hartford on that makeshift. The effort tore twenty odd spokes out of his rear wheel, and he finally reached Hartford afoot. The next day he had sparking troubles and was not heard from after Bridgeport. Russell, one of his mates, had the distinction of being the only man to be disqualified. He fell and broke a pedal and handlebar near Hartford, and then permitted himself to be towed for some distance. His disqualification was due to the honorable and sportsmanlike instincts of Arthur L. Atkins, manager of the Columbia Factory. Russell reached the Hartford control on time, and as none knew of his having been towed he was credited with a perfect score. He said nothing to the officials about his violation of the rules until an hour later, when Mr. Atkins compelled him to admit and report his offense. Only those who are in position to know the trade rivalry that existed and of Atkins’s keen interest in the event and its outcome can fully appreciate his honorable action. The two Holleys in the run were ridden one by George M. Holley himself, the other by E. L. Ferguson. The latter located a short circuit in the handlebar and then made a makeshift circuit by carrying the wire in his hand and against the handlebar. Later he attached the wire to the screw securing the spark lever, and when he suddenly encountered a gully in the road could not break the connection quickly enough, and was thrown headlong into the woods at the roadside, where he lay stunned for some forty minutes. He managed to reach Worcester and being badly “done up” he therein and as secretary of the promoting club joined the chairman and the referee and followed the run by train and checked the checkers at the different controls. Holley himself admitted some belt slipping. Beyond this triviality nothing happened. His control of his machine was superb. Neither mud, dust, sand, ruts, hills nor anything else fazed him. Once when another rider complained of the roads Holley smiled. From Left to Right: Holly, Pickard, Roberts, Bernard, and Checker Oatman, at the New York Control. Holley had not a fall and was always near the front. The only chance he did not take was that of disqualification. There was sharp rivalry for the credit of being first at the controls, and at Hartford Pickard, who arrived first, Jameson, Roberts and Henshaw were all cautioned for overspeed, and the penalty would have been inflicted but for a misunderstanding as to the position of the control flag, which entitled the men to the benefit of the doubt. Holley came in with the two Orient men, but he had so timed himself as not to require the warning. The second day was practically a Holleyday. He was in front all the way, and reached New York ten minutes in advance of the next man, Bernard. There has been some controversy on this point, but a Bicycling World man, stationed at the turn a half mile from the finish, checked and timed the leaders at theat point, as follows: Holley, 5:01p.m. ; Bernard 5:11p.m. ; Roberts and Jameson, 5:12 p.m.; Pickard, 5:13 p.m.; Sherman, 5:32 p.m.; Hendee, 5:36 p.m.; Tuttle, 6:01 p.m. The first four were ahead of their scheduled arrivals, and seated themselves in Central Park until they were free to arrive at the control across the street without penalty. A photographer induced them to come into the station to pose for their pictures, an act that came near spoiling Roberts’s clean score. The others were safe at the time, but Roberts had a few moments to kill and thoughtlessly joined them, crossing the threshold just fifteen seconds outside his unpenalized limit. Of the Royal entries, Hafelfinger gave a splendid account of himself. He used the smallest motor, one of the scant 1 1/2 h.p., but he also employed a two speed gear, the only one in the run, and with it was able to climb practically every hill, on some of which far more powerful motors balked. He scored 100 points on every control save the last one of the first day. On that stretch he ran out of gasoline, had a fall which bent his brake and hurt his leg. Further on he became so parched he accepted the invitation of some good natured Germans to help them dispose of a keg of beer and dallied too long. Ten miles outside of New York he punctured, and after riding some distance on his rim found a repair shop. The repair held until he came within twenty yards of the finish, when the tire again went flat. C. A. Pearsons, the other member of the Royal family, had made four perfect controls, when unknowingly his leg touched and opened the tap of his lubricating oil, which simply flooded his entire motor and created a short circuit that he could not locate. His enforced abandonment of the urn left him almost broken hearted. The only Auto-Bi in evidence, that ridden by Henshaw, behaved beautifully and had a clean score up to Meriden, where the fork-crown broke. The weeding out process was interesting. Three men failed to reach the first control, 23 miles. One fell out between the first and the second Worcester (45 miles), and five between Worcester and Warren, 71 miles. Between Warren and Springfield (100), where the worst roads were encountered, there were but two failures. On the road to Hartford (126) two more joined the ranks of the unfortunates, and one arrival was disqualified, making fourteen failures on the first day. On Saturday seventeen men started, and all reached Meriden (146 miles). Between Meriden and New-Haven (166), two declared themselves out of it. Between New-Haven and Bridgeport (186) none quit, and between Bridgeport and Greenwich (220) the ranks were further thinned by two. The thirteen who passed Greenwich reached New York (254 miles), and of these thirteen, seven finished within their allotted limit, and earned perfect scores of 1,000 points each, surprising even the promoters. All who survived and failed to win gold medals will be awarded bronze medals commemorative of the event, and presented by the Bicycling World. The contest was scored on a basis of 100 points for each control or checking station, of which there were ten. Each man was required to arrive within prescribed limits, there being a penalty of one point for each minute that he fell behind the slowest time allotted him. There was a penalty of three points also for each substitution of gasoline tanks, lubricant retainers, battery cases, cylinders, cylinder heads, crank cases, mixers, mufflers, driving gears and spark controllers, each of which was marked for identification before the start. On the machines that survived, however, there were no substitutions, and, of course, no penalties were inflicted. Of the thirteen survivors, seven, as stated, finished with perfect scores of 1,000 points each, and thereby earned gold medals, denoting the highest possible award, two others obtained blue ribbons for coming within 50 points of the winning score, one a red ribbon for earning within 100 points, and one a yellow ribbon for being within 150 points of the leader’s total. 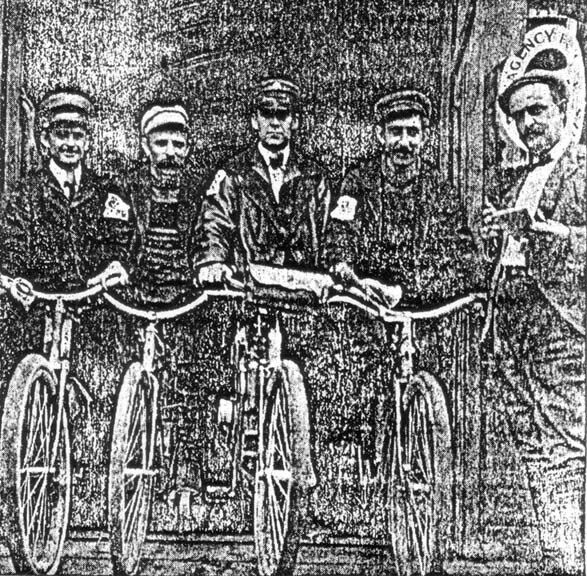 The Metropole Cycling Club Committee in charge of the run were Will R. Pitman, chairman; E. L. Ferguson, secretary; George W. Sherman, Henry Van Ardsdale and Charles E. Miller. Referee, r. G. Betts, president, Metropole Cycling Club; starter, Frank Kellogg, Massachusetts Bicycle Club; checkers, at South Framingham, Charles f. Whyte; at Worcester, Lemont and Whittemore: ast warren, D. E. Graves; at Springfield, W. E. Crowe, Massasolt Cycle Club; at Hartfor, H. W. Alden; at Meriden, Wusterbarth Brothers; at New-Haven, Campbell Cycle Company; at Bridgeport, William Stiff; at Greenwich, C. H. Minchin; at New Yhork, Alderman Joseph Oatman, president A.C.U. of New York. Special thanks to the Bradford Landmark Society, Bradford Public Library, and Mary Pierotti for all their hard work and patience. Thank you.